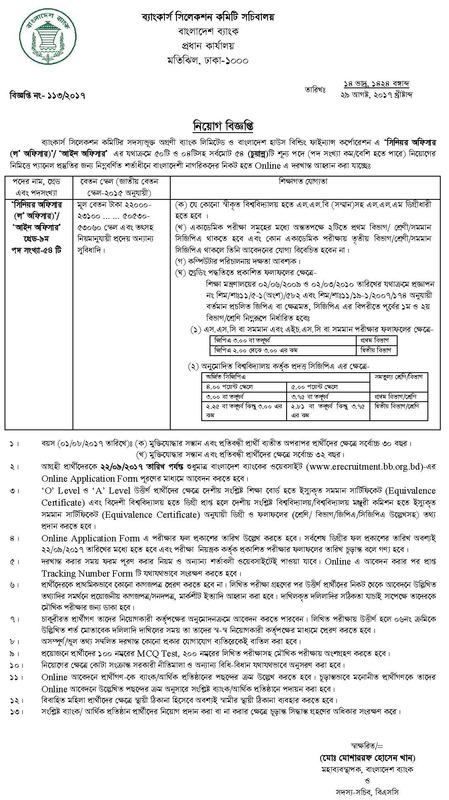 Agrani Bank Limited and Bangladesh House Building Finance Corporation job circular for the post of Senior Officer (Law officer). Banker Selection Committee published a recruitment notice of these two bank. Before apply read carefully job description below. Educational Qualification: LLB(Hons.) and LLM from any Govt. approved university. At-least two first division/class. Third division/class in any stage of examination is not allowed. (b) Maximum 32 years for son/daughter of freedom fighter or Handicapped Quota. In online application applicants have to mention Choice Order of bank or financial institution. In the application procedure you must have passport size photograph & signature of Scanned or Digital print. Applicant must mention result publication of all examination. Applicant should save Job Tracking Number after online application for future use. Remember if any candidates give wrong information in the application form, their application would be rejected without any prior communication. If you think you have all qualification they required don’t you can apply. This is a huge opportunity for job seekers. Please share this job with your friends and stay with our website www.careerguidebd.com for further information and all kind of job circular and job notice. And don’t forget to like our Facebook page for update information.